All Azure AD tenants are named as sub-domains of the root onmicrosoft.com. For example yourcompany.onmicrosoft.com. Some very early adopters of eg. Office 365 might also have tenant names that look like this emea.microsoftonline.com, but AFAIK all new tenants will inherit the onmicrosoft.com domain. But names are fickle, so every Azure AD tenant also has a Globally Unique IDentifier, or GUID that is guaranteed to be unique (as the name implies) within Azure AD. When you sign up for a service like Office 365, which uses Azure AD in the same way Exchange Server uses Active Directory. You can immediately start using services like Exchange Online and Skype with your default Azure AD tenant domain. Needless to say, it is not a user friendly domain name, either for logons or receiving email, so almost everyone adds one or more custom domains. Sometimes it might be useful to know what the GUID of your tenant is. Perhaps you need it to file a support request, or you want to work out what is going on when you do federated sign-ons against Azure AD or you are working with Azure AD B2B. Finding the GUID is not as easy as you might think. It is not displayed in the Azure AD portal, nor is it available in Azure AD PowerShell. You actually have to dig a little to find it. Sometimes it pops up in your browser address bar when you log in, but you have to be sure that it actually is your GUID that is display there, and not someone else’s. 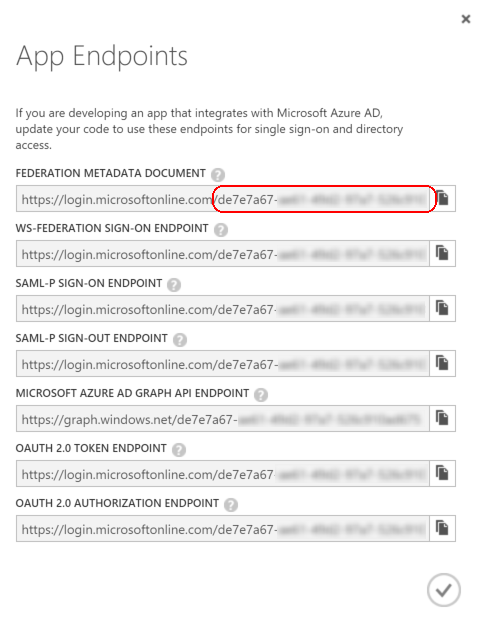 Find or create a custom application that is integrated with your Azure AD tenant. To create a new application is very easy and you can immediately delete it once you have what you want. Press the View Endpoints button at the bottom of the screen. Copy your GUID and store it in a safe place. If I come up with an easier way to find the tenant GUID I will update this post.